Antrim's promotion hopes in Division Two A of the Hurling League suffered a major blow as they were edged out 1-17 to 1-15 by table-toppers Westmeath. The Saffrons led 0-6 to 0-4 after 25 minutes but Westmeath hit 1-5 without reply before half-time - including substitute Niall Mitchell's goal. Keelan Molloy's goal helped Antrim level within six minutes of the restart at Corrigan Park. However, Westmeath moved three ahead again and held on to win. There was a controversy late in the game as James McNaughton thought he had notched his 11th Antrim point to cut Westmeath's lead to only one with still around two minutes of injury-time left. However, following a long consultation, the match referee backed his umpires' assessment that the shot had been a wide. Antrim had one further attack with an attempt for a point coming back off a post. The victory maintains Westmeath's 100% record after three games. Antrim drop to fourth in the table having lost their opener against Kerry before narrowly beating Meath in their second game. The key period of the match was the 10 minutes before half-time as Westmeath produced their crucial unanswered scoring burst of 1-5 which left them six up at the break. McNaughton hit five of Antrim's opening six points as they led 0-4 to 0-2 and 0-6 to 0-4 but scores from Shane Clavin and free-taker Allan Devine - allied to the first of two successful sideline cuts from Derek McNicholas - edged the Lakelanders ahead before substitute Mitchell lashed in the goal. With the Saffrons momentarily stunned, McNicholas and Devine added further scores to suddenly change the course of a previously tight first half. To their credit, the Saffrons hit 1-3 without reply in the six minutes after the restart as Molloy struck 1-1 in addition to McNaughton's two latest points. However, Westmeath quickly regrouped as Killian Doyle and Mitchell notched efforts from play. 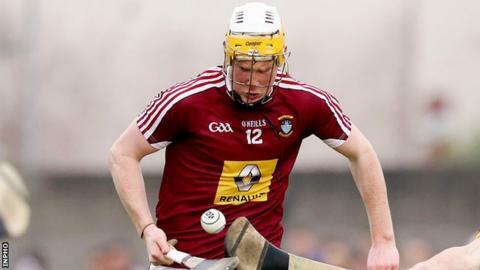 It was at that stage that Antrim boss Neal Peden opted to bring on Cushendall stars Neil McManus and Eoghan Campbell, who along with club-mate Ryan McCambridge and St Enda's Joe Maskey, were available again following their All-Ireland club championships involvement. Given McManus' pedigree, it did seem a little surprising that he didn't come on earlier than the 47th minute, when he replaced injured Kevin Rice. The teams went score for score over the next 20 minutes as the Saffrons couldn't get closer than two down. However, two points in a minute as the game was about to enter injury-time left just the minimum in it before a superb McNicholas free doubled Westmeath's advantage. Then came the controversy over the McNaughton point that wasn't as Westmeath took Antrim's promotion fate out of their own hands with the Saffrons now needing other results to go their way in the closing two rounds to maintain any hopes of reaching the Division Two A Final.